This 12 year-old expression from The Balvenie is aged in first- or second-fill bourbon casks, with up to a further year in first-fill oloroso sherry casks. While The Balvenie’s range is typified by honey and a distinct heather flavor, the DoubleWood’s sherry influence is bigger and weightier, hiding some of those delicate florals. The Balvenie is my favorite Speyside distillery, and they have an interesting range of different cask finishes, from port barrels to a new rum cask matured 14-year. Nose: Smells like peaches and peach-pit, marzipan, cedarwood and pine, honeydew melon. A drop of water tames the alcohol fumes, and releases a ghost of heather, clover, and mown grass. Palate is heavy with vanilla and woodiness, complimented by a toothy mouthfeel. Flavors of freshly-baked sugar cookies, caramel, and marshmallow. The sherry oak presence steamrolls the usual house-style delicacy and notes of heather and farmstand honey, but the result is a solid, silky whisky that reminds me of bourbon. Interestingly, the sherry fruit flavors (which usually dominate a sherried whisky) are light and in the background, contributing only some dark plum, fruit pit, and peach flavors. A few drops of water brings out some floral accents without diminishing the powerhouse oak. Finish is medium-long, relying heavily on the wood accent, some caramel apple, blackstrap rum, toasted clove or cinnamon, and red-wine tannins. Not as easy-drinking as the Single-Barrel expression from The Balvenie, nor with as many fruit and flower notes. 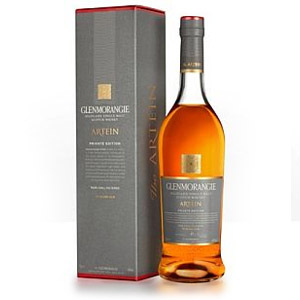 However, this Scotch stands on its own as a beautiful example of what quality Speyside whisky and careful oak aging can do, and with a fantastic price point. This gives oak-lovers a two-dimensional whisky with some unexpected twists, all on a pristine base of one of the best malts in Speyside. This is a great whisky for getting into scotch! I love this whisky. It is my every day dram. Runs about $30-$35 in Vegas. The Balvenie produces good whisky. I love this whisky! I can get it for about 55.00 up here in Washington so I pay the high end for sure, but still love this one even for what I pay. I pull this bottle out at least 3 nights a week for a pour. “Day dram…” I see what you did, there. And I agree en total. Cheers! Just bought due to your reccomendation. I love it! The wife tasted a bit of raspberries near the finish when she swallowed. I tasted something sweet but couldn’t identify. Thanks for a great recommendation. BTW, the wife hates the Bowmore Darkest, way to smokey for her, but i love it. Glad you enjoyed it! 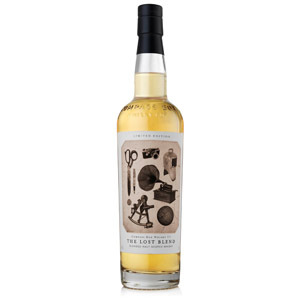 A good compromise might be Highland Park 12 – it’s mildly peated/smoky, but also sherried and quite fruity. Cheers! Picked up my first bottle of Balvenie tonight and was blown away. 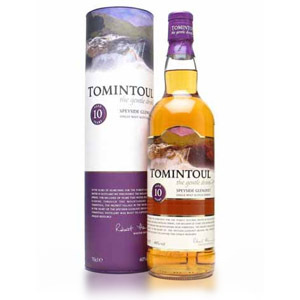 This is a top notch speysider that is very value friendly. I definitely get the wood flavor and almost a buttery caramel. Wonderful! Just went back to the store for another bottle. I was expecting close to the same price as two months ago, maybe three four bucks more. FIFTEEN DOLLAR price hike! $36.99 up to $53.99! I’m switching to bourbon. This isn’t worth it. I bought a Four Roses Small batch for $21. I’m with you, buddy. The K&L blog today mentioned a $7 increase in DoubleWood 12. Lately, I’ve been drinking more stuff like Bank Note blended scotch, to make my pricier bottles last longer. I really like this scotch, but all I get on the nose and palate is vanilla, vanilla, and vanilla. And did I mention vanilla? Maybe my palate isn’t refined enough to pick up the fruit that would come from the sherry barrel? Whatever the reason, I’m going to keep trying it to see what else reveals itself. What glass are you using? If you’re not already, try a Glencairn glass (my favorite) or really any curve-sided glass that gets smaller at the top (a wineglass works, in a pinch). You may be able to smell more distinct aromas that way. Also try adding a few drops of water (literally drops) to “loosen up” some additional aromas. Next, try covering the top of the glass with something (like a coaster) and let the vapor accumulate, then pull it off quickly and stick your nose in. Also try positioning your nose at various levels above and inside the glass. Lastly, try opening your mouth while you draw air into your nose – it can help. Cheers! I never drink only one type of scotch at a time. I agree that you must use the Glencairn glass but I always pour two and compare. 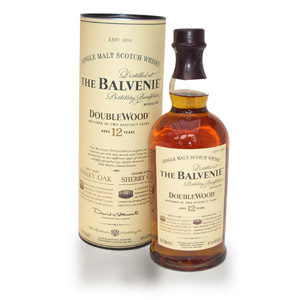 The Balvenie has a wonderful flavor and a must try. Bought this on your recommendation. I really like it! And I very much agree, as did a friend, that this is the “missing link” between bourbon and scotch. Seriously, this is an excellent dram, especially for the low price. If you want to try Bourbon I recommend E.H. Taylor Small Batch. My malt. I like to call this one my “comfort whisky,” because it never fails to be an amazing dram, especially at its price point. It has a fantastic flavor on both ends, the oak up front, and a great sherry finish. It isn’t a sherry bomb like The Macallan. Don’t get me wrong, I like that one too when I’m in the mood for a sherry bomb. This one is always good in a pinch with not an overpowering sherry flavor, but just a hint. It’s an excellent Speysider, and I hope to visit them someday. So far The Balvenie is my favorite distillery; mind you. I’m still exploring, but I always seem to come back to them. Just bought this after trying the Glenlivet 12. I’m a noob but I definitely like the Balvenie better. When I tried scotch many years ago in Scotland, I was put off by the strong smoky flavor and didn’t try scotch again until just recently. I taste none of that smokiness in this. Guess I’m a scotch man now. Bill, Glad you enjoyed the Balvenie! I like it better than Glenlivet 12 as well. The smoky flavor you experienced probably came from a peated malt, which are distinctly smoky (peaty), and can be very strong. Avoid malts from Islay (Lagavulin, Laphroaig, Ardbeg, Caol Ila, Bowmore, Kilchoman), Talisker, Highland Park, and anything that says “Peat” on the label (such as Balvenie Peated Cask) and you should be fine. The majority of scotch is actually not smoky at all, even single malt from distilleries that use malted barley with a low level of peat in it. Cheers! BEST. Tried em all. Of course, some richer…but best everyday wee dram. We call it Mr. Balvidere in our clan. After finishing off my bottle of Macallan 12, I’d like to try some alternative Speyside/Highlands malts with a sherry influence. So how does this Balvenie compare to Glendronach 12 and the Macallan? Macallan has more fruit flavors derived from sherry, because it’s aged for all 12 years in sherry barrels, while the Balvenie has more nutty/caramel flavors and is overall a bit lighter, because it’s aged in a combination of ex-bourbon and ex-sherry. If you really want to look for comparable sherried malts, I’d look for GlenDronach 12 year, GlenGoyne 12 year, Tamdhu 10 year, Aberlour abunadh (cask strength), or Glenmorangie Lasanta, to name a few. Cheers! So of course I had to get a bottle of both this Balvenie and Glendronach 12. I love the Glendronach – it has immediately become my favorite sherried malt (at least until I get to try the 15). As for The Balvenie 12, I agree with your assessment – lightly peated, no smoke, just a hint of sherry. I find myself favoring bolder flavors, whether that be an Islay or Glendronach – but that said this is a well executed scotch and agree it is a great introduction for new scotch fans. Just starting into Scotch tasting – having some fun and enjoying your blog. Do you have a review for the 12yr Single Barrel. It is available from the LCBO at $104.95. That would be $20 more then the DoubleWood. I dont mind giving it a shot, just wondering what you thought of it. I haven’t tried the 12 year Single Barrel – I was referring to the 15 year Single Barrel, which has been excellent every time I’ve tried it. Single-Barrel bottlings are generally more expensive than their “large batch” equivalents, so a 20% higher price is probably about right. I recently decided that I wanted to try Scotch. (I normally despise brown liquors but my fascination with Scotland beat out my dislike.) I chose the Doublewood 12 Year because it was the ONLY Scotch I found that was Doublewood. (Not that I knew what it meant at the time but it was different than all the others, so I chose it.) And I am so glad that I did. I have absolutely fallen in love with this Scotch and am currently on my second bottle in as many weeks. I AM IN “SCOTCH HEAVEN” and “anxious to TRY” with several other “12 YEAR OLDS” that I “thought” HAD a bit too much “alcohol NOSE” !!! Can we do a “NATIONAL TV AD CAMPAIGN” for “Scotch NooBs” about the POWER of a “FEW DROPS” of H2O? Out of pure “curiosity” … ANY, “particular” few DROPS of H2O … THE BEST? Any water that is room temperature and free from chlorine or other chemical additives works fine. I personally use tap water filtered with a Brita filter. Any bottled mineral water or natural spring water would work even better. Some Scottish distilleries sell bottled water from their springs (which theoretically works ‘best’) but I’ve never seen this in the US, and I doubt it would make enough difference to justify the price. Cheers! I’m about halfway through my first bottle of scotch and while I love the Balvenie 12 Double Wood, I’m already wanting “more”. That said, I think I will likely always keep a bottle of Double Wood on-hand! Any recommendations for my next bottle of single malt? Thanks in advance! I’d go for something heavily sherried. GlenDronach 12 is a good choice, as is Macallan 12 (not “Fine Oak”). I prefer the ‘Dronach. Or, if you like smokey things you could try something peated. Lagavulin 16 is a great peated malt. Talisker 10 is a little rougher but with more peat flavor, and Laphroaig 10 is cheaper and rougher, and has a different flavor profile (less sweet, more briny). Cheers! I picked-up The GlenDronach 12 (which apparently is more like an 18 year in reality). Love it! Thanks for the suggestion. This is a fantastic whisky, at least to my novice taste buds. Think I will next try the Laphroaig 10 and it’s peat! Thanks again. It’s a amazing what a small amount of water adds to this. For me I added one small ice cube (I know you frown on ice) and it pretty much transformed this scotch for me. The aroma completely opend up with honey and vanilla. Thank you for the awesome recommendations and reviews. Very new to scotch but excited to have found a rewarding new hobby! 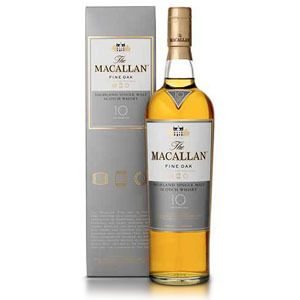 Tried Macallan 10 Year Fine Oak, then read mainly negative things about it…unfortunately was not impressed when trying it…just bought Balvenie 12 Year Doublewood today and cannot wait to try it this evening! Was $56.99 in Nashville, TN. Thanks for this great website! Balvenie doublewood is an excellent scotch. i find this scotch to be very balanced, full body, amazing flavor and nice a finish. But for less money Glenmorengie 10 is as good. Cheers! I may be losing my mind but I have a bottle of Paddy’s Irish Whiskey and it tastes a lot like Balvenie Doublewood!! I only drink my whiskey on the rocks so it may taste different neat, but it’s darn good (especially for the price)!!! I’d highly recommend trying Paddy’s Irish Whiskey if your looking for an everyday tipple!! Hi I’m new to drinking scotch and I’m ashamed to say after finishing a few bottom shelf whisky, I still don’t have the ability to detect minute flavors. The nose, pallate, finish all of them I just rely on recommendations from you. I’m 26 years old and as you can summise, I don’t have the luxury of disposable income to splurge on the finer whiskies. I’m currently finishing my bottle of jw black and would like to try bourbon next. I’m torn between Makers Mark or Wild Turkey 101. Any suggestions? Thanks! Hi Benedict. I like Wild Turkey 101 quite a bit, but these days my favorite inexpensive bourbons are Buffalo Trace and Eagle Rare 10 year (both made by Buffalo Trace distillery). I’ve never liked Maker’s Mark, although it has a lot of fans. Most bourbons that are under $50 are going to be very similar, so if you find one that you enjoy, I wouldn’t sweat over whether it’s “the best”. Cheers! I agree. Wild Turkey 101 & Eagle Rare are 2 excellent bourbons and both under $30 in Pennsylvania. I find it curious that some places sell 40% abv Doublewood while I just purchased 43% abv Doublewood in South Carolina. Is there rhyme or reason for this? The price on the Doublewood I picked up today was nearly $65, which is about what I paid for 15 yr old couple years ago. Insane! Love this stuff. I tend to like “entry level” scotches as I like things that are easy drinking. I usually switch between this and Glennfiddich 15 Solera with the ever so slight edge going to Balvenie. Began my whisky journey with McCallan 12 & Highland Park 12 before trying this gem. Amazing easy sipper, and am I tasting a bit of almond on the finish? Thanks for the great writeup and blog! Just received a bottle for my 50 th Birthday. As soon as I poured it into my whiskey glass, I knew I had something special. Great fruity aroma. The taste was strong but not too oakey. Great sipping binge watching Netflix. A great scotch. I only wish that my prices paid were more similar to those prices reported to have been paid by the Noob. Some of my reviews are quite old by now (this one was from 2011!) so the prices may be very out of date. I generally find DoubleWood 12 for $43 – $45 near me, these days. Cheers! Not sure if the batches have changed any but I find the finish to be extremely short on this one and not long at all…actually the shortest finish on a whisky I have had. I think this is a great beginners scotch but if you like long finishes and more sherry then I would skip this one. Price is 60usd now in florida and IMHO its not worth it. Better off getting a glendronach or glenfarclas if the price is right.